Wooden train cars and tracks are one of the more unique gifts for children for birthdays and on Christmas. They provide a fun activity that can involve the entire household. Whether it be laying down train tracks meticulously to spell out a word or just creating one big circle in the middle of the living room, wooden train cars and tracks are sure to bring fun in back into your homes. The placement of wooden train tracks isn’t just for children. Adults can try their hands on intermediate sets to create their own series of multi-level and criss-cross railroads to place the wooden toy trains on. The activity itself is light enough for kids to get into and spend hours upon hours of random tracks on the floor, but with great enough depth for the grownups to challenge themselves mentally in building a magnificent train track layout in the playroom. Features a vast collection of train cars and engines under the Orbrium Toys brand. The wooden train car collection includes engines, a tender, coaches, a convertible coach, a cargo car, a magnetic cargo load, a tanker car, a magnetic tanker load, a hopper car and cabooses for a complete customizable experience. Comes with a beautiful wooden frame to display the wooden train cars when not in use. The wooden train cars fit the most common wooden train tracks found in the market. A great attention to detail on all the cars, but with enough leeway for one’s imaginations to run wild. This collection by Orbrium Toys boasts a great variety of wooden train cars which truly makes it a more immersive experience. No longer will you have to imagine the coach actually being a cargo car because there’s an actual piece for that. The bright colors, the amount of details spent on the train cars and the functional crane are nice final touches on what’s already an impressive wooden train car collection. There is a noticeable redundancy issue with some designs repeating on the wooden train cars. They only differ in window structure and color of the piece. There are enough wooden train car variations on this 12-piece collection by the Orbrium Toys brand that will keep you immersed enough to not buy another set for quite awhile, if ever. Boasts a neatly painted 12-piece wooden train car and engine set with a wide variety of coaches, cargo cars, load cars and magnetic cars. 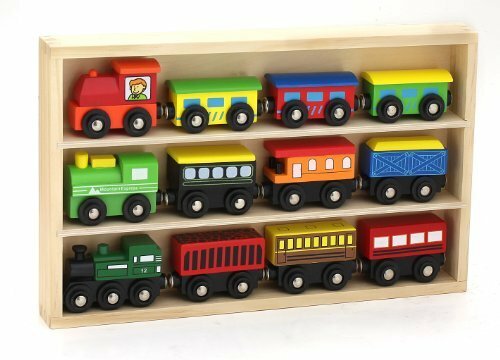 Comes with a tidy wooden display frame that fits all of the wooden train cars for both storage and presentation purposes. The wooden train cars are compatible with most wooden train tracks in the majority of train table sets out in the market. The magnetic cars are compatible with magnetic cranes in other play sets. The wooden train car collection has an impressive amount of detail on their diverse set of pieces which can be mixed around for a unique experience every time they’re used. The fact that they’re compatible with a lot of the wooden train tracks out in the market makes them a must-buy for those who are willing to expand their pre-existing collection with 12 more colorful pieces. The implementation of the magnets do not work well on rough terrain such as indoor carpets. Magnetic wooden train cars are known to split up and cause frustration whenever they have to be put back together. This expansive collection will definitely be a good addition to a collector’s existing wooden train car set or a child’s first ever set. It’s advised, however, to buy stronger magnets if you intend to let your kids manually maneuver the cars around carpeted floors to prevent them from splitting up when linked. What a lovely set to be added in your collection of wooden train cars and tracks. This is a short clip of the product and how it looks like being connected with each other. The compatibility of this train car set of 12 pieces that comes in a nice wooden frame is highly regarded. It uses standard sizes and magnetic couplings to connect with major wooden train toy brands. Right Track Toys brings you the immersive experience of being a conductor with this expansive yet cost-effective wooden train car collection. Wood train tracks are of premium grade and comes with no limitations of what you can come up with be it loops or straight paths. Right Track Toys makes it easy for you to integrate your current wooden train car collection by being compatible with major brands like Thomas & Friends and Brio at a more affordable price. The 52-piece wooden set contains the standard tracks you’d come to expect and more. Being cheap is not the only sales pitch that Right Track Toys have, but they really give you the satisfaction that you paid the right amount of money for the right amount of pieces, if not more. The premium grade wood used on the train tracks makes this collection a steal adding in the fact that it’s compatible with most of the wooden train car sets available in the market. The 52-piece pack lacks in detail and uniqueness. If you expected similar looking standard wooden train tracks, then that’s what you’ll get from this pack. If you don’t mind the generic look of this 52-piece wooden train track pack, then this is definitely a steal considering the amount and compatibility with all the major brands. This is an affordable way to add more length to your set if you’re running out of tracks. Ready to expand your wooden train track collection? This 56-piece set is just the pack for you. It includes premium wooden train tracks that piece together regardless of what you connect next. Features a unique see-through tunnel piece and track adapters to suit your needs. Durable and solid beech wood was used to make sure that these wooden train tracks last for a long amount of time. 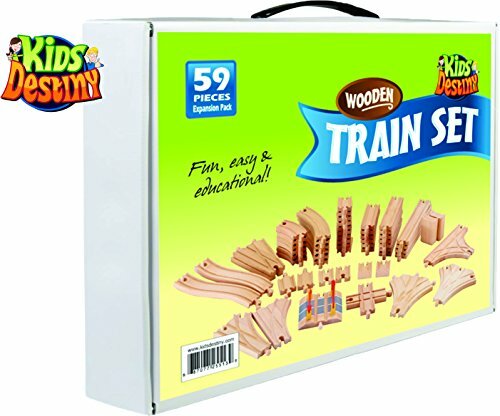 This premium grade 56-piece wooden train track will brighten up your collection and add unique twists and turns for your wooden train cars to take, including a see-through tunnel piece. Though most of the pieces will fit with each other, there are several track adapters available. Just enough to make sure that whatever you’re planning comes to fruition on these wooden train tracks. To top it all off, the set is compatible with all major wooden train car brands. Older versions of this set is not compatible with this 56-piece wooden train track which has become an issue for collectors trying to upgrade while maintaining their current tracks. Unless you’re one of the few that don’t can’t upgrade to this wooden train track pack, you won’t have an issue. This pack will definitely prove as a useful expansion of any of your current existing sets. Kids Destiny Toys brings you and your family the joy of expanding your collection these premium wooden train tracks to lengthen your railroad and keep your conductor dreams alive. The variations are limitless and compatibility is unquestioned. Thomas & Friends, Brio and other major wooden train car brands will definitely fit on these wooden train tracks as they fit right into your current collection. This beautiful crafted beech wood wooden train track would be one of the more durable additions to your collection. 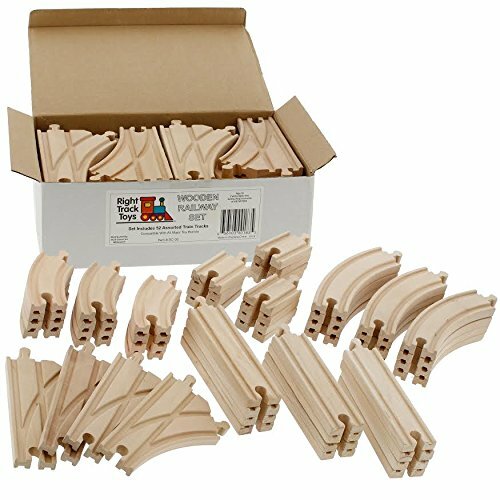 Familiar pieces of straight, curved and curved switch track are in abundance in this pack of 59 wooden train tracks. The redundant pieces of standard wooden train tracks might not be right for you if you were looking at more unique options beyond the three generic pieces. If you’re just getting started with your wooden train conductor career, then this 59-piece pack is perfect for you. If you’re looking to expand your existing collection expecting unique pieces, then consider something else. The premium beech wood these train tracks were crafted on makes them reliable as they will most likely stand the test of time. Orbrium Toys brings you 6 arches viaduct bridge for your wooden railway track collection. If you’ve ever needed that arch to guide your wooden train cars through a terrain not available on flat areas, then this is the perfect pack for you. Expand your collection by creating a multi-level wooden train track with these arches. The tracks are verified to be compatible with Thomas & Friends and Brio wooden train cars. Trains can even fit under the viaduct if needed. This is a well thought out wooden train track pack. You can horizontally place this on top of your vertical track to make a path above it. The best part is your trains can go underneath the viaduct making this 6-piece arch viaduct bridge a great addition to your collection. They’re made out of meticulously detailed solid beech wood. The bridge itself spans 26 ¾ inches long and 3 ⅜ inches tall giving you enough options as to what you want to do with the wooden train tracks and how you’d implement them on your layout. Unless you want to make a multi-level wooden train track, then there’s really no reason for you to buy this pack. This pack is great for those who are interested in expanding their wooden train track collection to a more advanced level with these 6 arches viaduct bridge. They’re compatible with the major wooden train car brands so they’ll fit right in to most sets. A well-established brand boasted only the highest quality wooden toys, Brio introduces this intermediate wooden train track expansion pack containing 16 pieces with varying straight and curved sections. 2 tracks switch in either directions to give you the freedom to choose where your wooden train cars go in your layout. As is standard, it is 100% compatible with all Brio wooden train car sets. As the expansion pack itself states, it’s a wooden train track set for the intermediate level. Surely enough, you’ll find pieces on this pack that you won’t find in basic ones. There are two switch tracks that go either directions and they easily fit with other pieces just like the rest of the pack. The attention to detail is what you’ve come to expect from the Brio brand and since it’s under their umbrella, all wooden train tracks and wooden train cars are compatible with this intermediate expansion pack with ease. Depending on your existing wooden train track set, it’d be best to check if these pieces would fit with the ones you have right now. Some have complained that these don’t fit with basic packs from other major brands. If you want to spread your creative wings and venture onto the intermediate level, then this Brio expansion pack is the perfect addition to your wooden train track set. Just make sure you know that the pieces you have will be compatible with these. If you’re a Brio purist, you shouldn’t have a problem with this outstanding piece of woodwork. An awesome collection of wooden train tracks coming from Orbrium toys. This massive 110-piece pack boasts a wide selection of tracks including multiple directional switch tracks, elevated pieces and even a 6” bridge. Ready to make the big jump to multi-level wooden train track layouting? 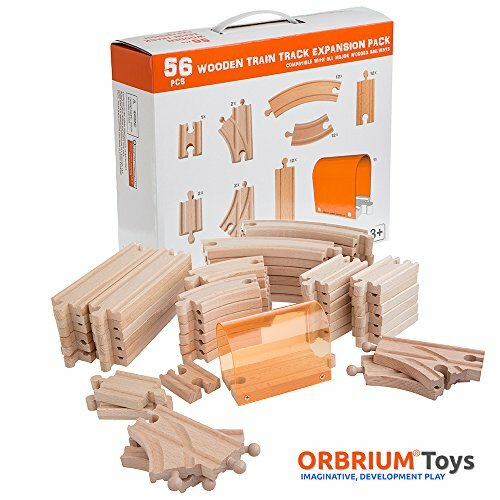 The 110-piece Orbrium Toys multi-level wooden train track expansion pack is the perfect one for you. This huge wooden train track expansion pack is for those aspiring to have a more complicated layout for their wooden railroad system. Watch as your wooden train cars go from the flat grounds onto elevated areas and even bridges. The exclusive Stackable Track Riser makes sure that your wooden train tracks are just the perfect height. With the amount of pieces you have in this pack, there’s no telling just what you’d be able to creative with an imaginative mind. The beautiful sturdy beech wood craft makes sure that your railroads look good and stay that way for a long period of time. If you don’t have the chops to pull off an impressive multi-level wooden train track, there’s really no point in expanding your set with this pack right now. 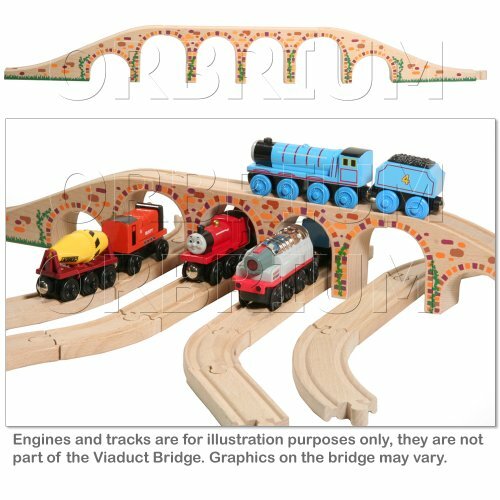 It’s far too ambitious to have this pack if you’re only at the basic level of layouting your wooden train tracks. The amount of detail, variation and immersion you will witness from this pack will make your imaginations run wild with new ideas. How high will your set your wooden train track? Do you want it to bridge the gap between an unreachable terrain? 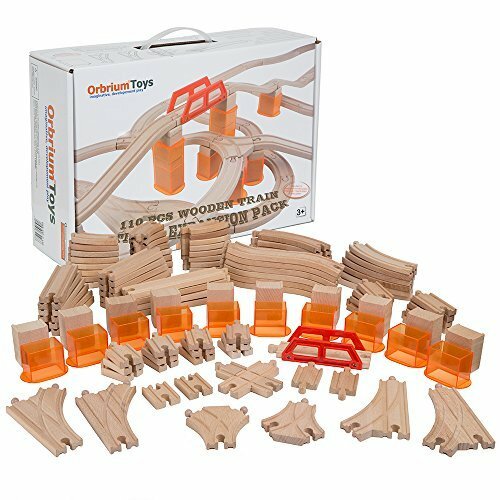 This is the perfect wooden train track expansion pack from Orbrium Toys. There are a lot of options when it comes to wooden train cars and tracks, but knowing where your layouting skill level is at will be vital when choosing just the right pack for your collection. If you’re too ambitious and get an intermediate pack on the get go, you’ll find yourself lost and probably not using most of the pieces that come with it. It’s best to start small with a basic pack and a handful amount of wooden train cars. Study how you want your railroad to work. If you feel like you’ve grasped just enough to take the next step, then try perfecting an arch with a path above and beneath it. When you have enough experience and you think that it’s enough to pull off a multilevel railroad system, then that’s when you expand your wooden train track sets. Good luck, aspiring conductor!